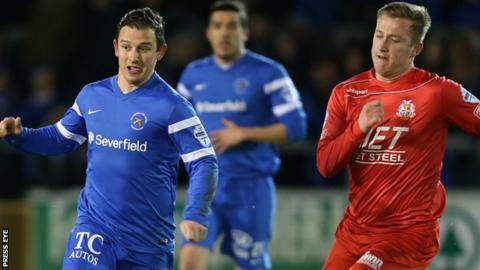 Ballinamallard eased their relegation fears with James McKenna's second-half goal beating Portadown in Monday's Irish Premiership match at Ferney Park. When Ivan Sproule's shot came off the post, McKenna pounced to blast home the rebound after 67 minutes. Both sides had numerous chances to break the deadlock with Ports' Sean Mackle hitting the woodwork in the 27th minute after Mark McAllister's cross. It was a good response for 'Mallards after Friday's 3-0 loss to Warrenpoint. Sproule caused problems down the right and had several chances to break the deadlock for the home side in the first half. He shot from a tight angle which Ports 'keeper David Miskelly saved with his legs. Marcio Soares was through one-on-one with Ballinamallard 'keeper Alvin Rouse but shot into the side netting. The two players faced each other again after 57 minutes with Soares going round Rouse but Emmet Friars got back for a great goal-saving challenge. Garth Falconer's long-range shot was spilled by Miskelly but the 'keeper quickly made amends saving Sproule's shot with his legs. After McKenna opened the scoring, Ballinamallard could have doubled their lead late on when Adam Lecky's great turn released Ryan Campbell but with only the keeper to beat, his shot hit the post.